Various Kaiser Permanente Member Health Education materials for the Southern California region. 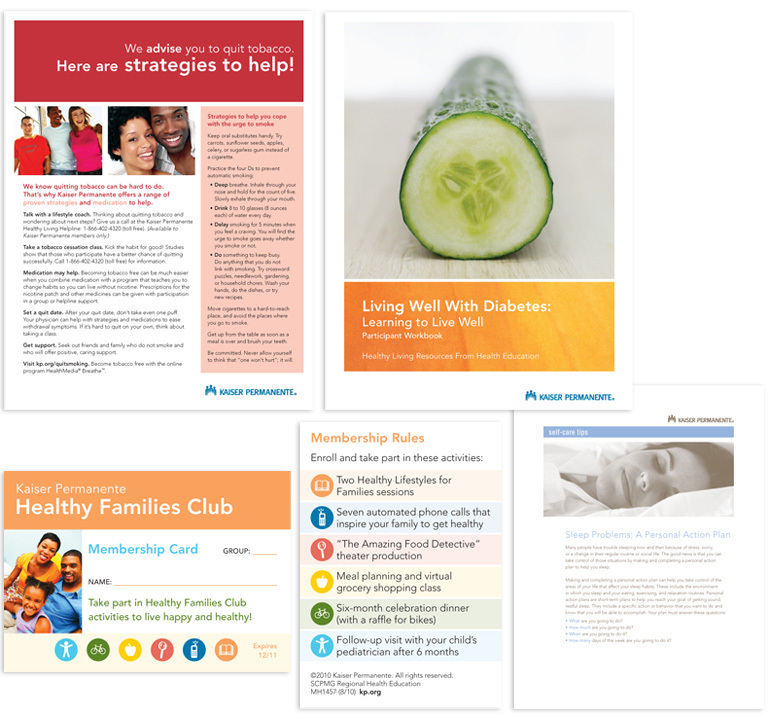 Clockwise from top left: Tobacco Cessation flyer; Living Well with Diabetes Participant Workbook, cover design; Self Care Tips: Sleep Problems brochure; Healthy Families Membership Card, front and back. Poster and booklet design for the California State University. 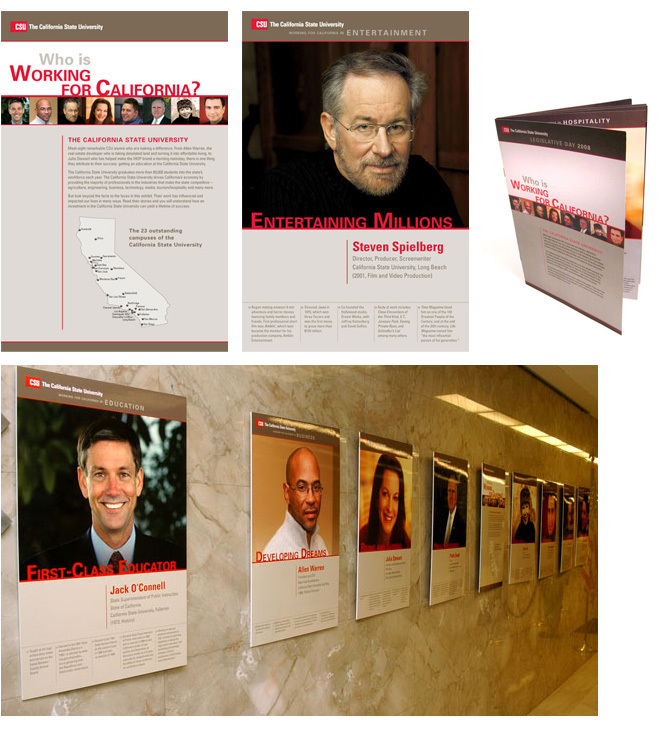 Clockwise from top left: Sample poster designs; Booklet design; On display in the California State Capitol building. WINNER, CASE District VII Award of Excellence, 2008. 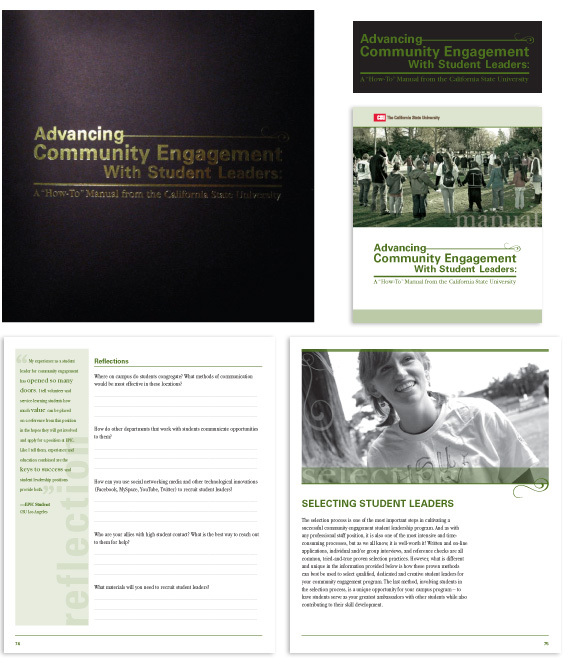 Manual design with slide-out workbook for the California State University's Center for Community Engagement. Clockwise from top left:Die-cut cover with foil stamping; Cover artwork; Manual title page; Sample chapter heading; Sample workbook page. Sponsorship Kit design for the California State University's How to Get to College poster. 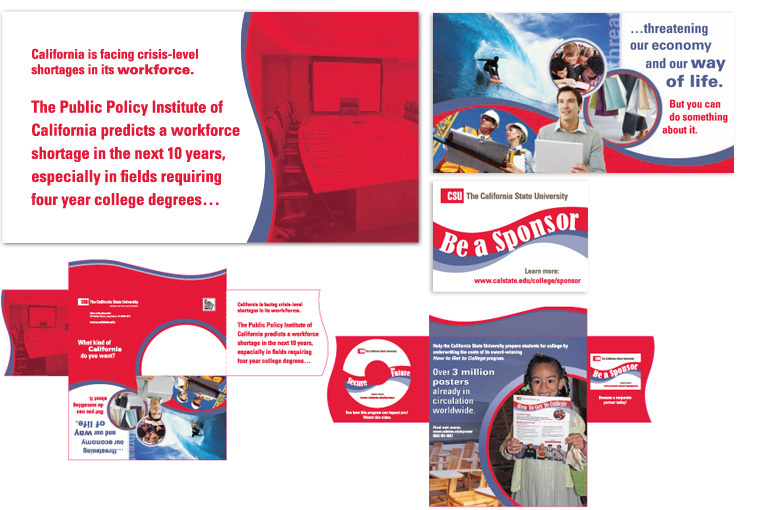 Clockwise from top: Front of die-cut mailer; Design of first panel revealed when opening mailer; Magnet design; Folded-out interior of mailer (including attached DVD, magnet, poster); Folded-out back of design, including mail panel. 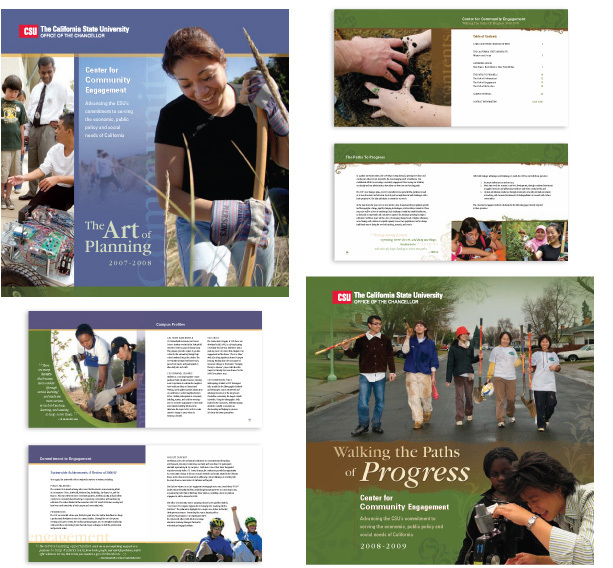 Two annual report designs for the California State University's Center for Community Engagement. Clockwise from top left: Cover design of 2007-08 annual report; Sample pages from 2008-09 annual report; Cover design of 2008-09 annual report; Sample pages from 2007-08 annual report. Invitation design for South Coast Repertory's 2007 Gala Ball. 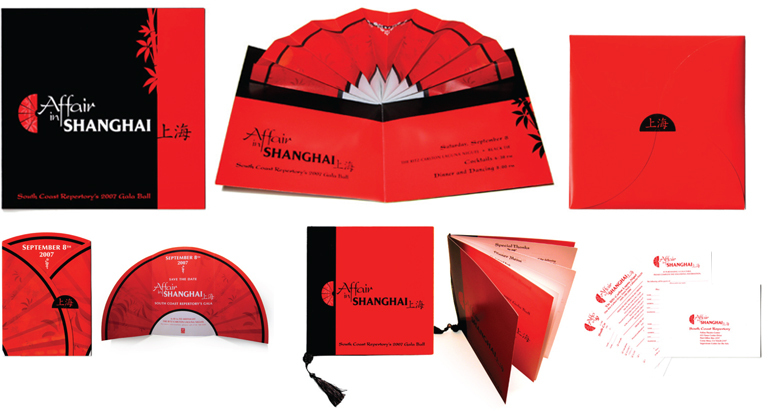 Clockwise from top left: Front of invitation; Inside of invitation (featuring a die-cut, pop-up vellum fan); Custom die-cut envelope; Reply card, map card, donation card, and reply envelope; Gala program (top view and front design); Save the Date Card (die-cut mailer with custom sticker). 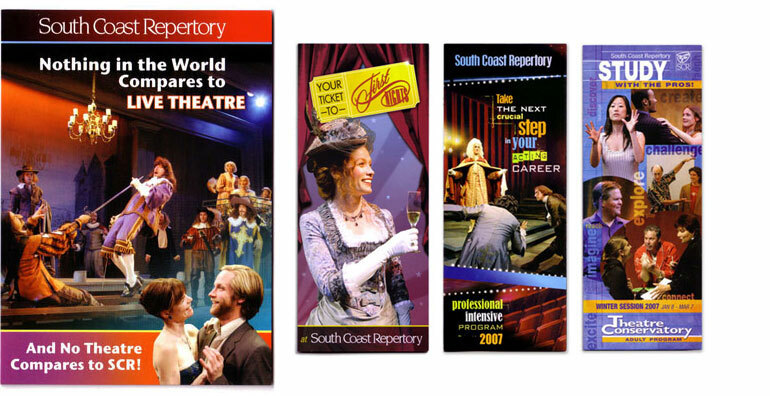 Design for South Coast Repertory's 2007-08 fold-out Season Brochure. Clockwise from top left: Interior spread showing show schedules/descriptions; Interior spread showing order information/seating charts; Front/back spread including mail panel; Interior photo spread. 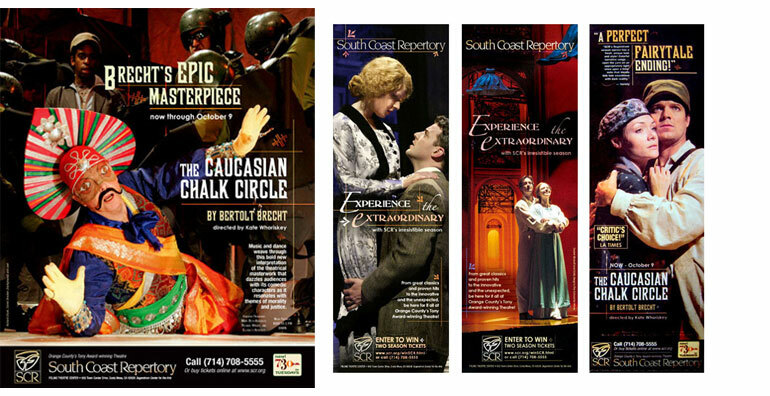 Design for various South Coast Repertory marketing brochures. 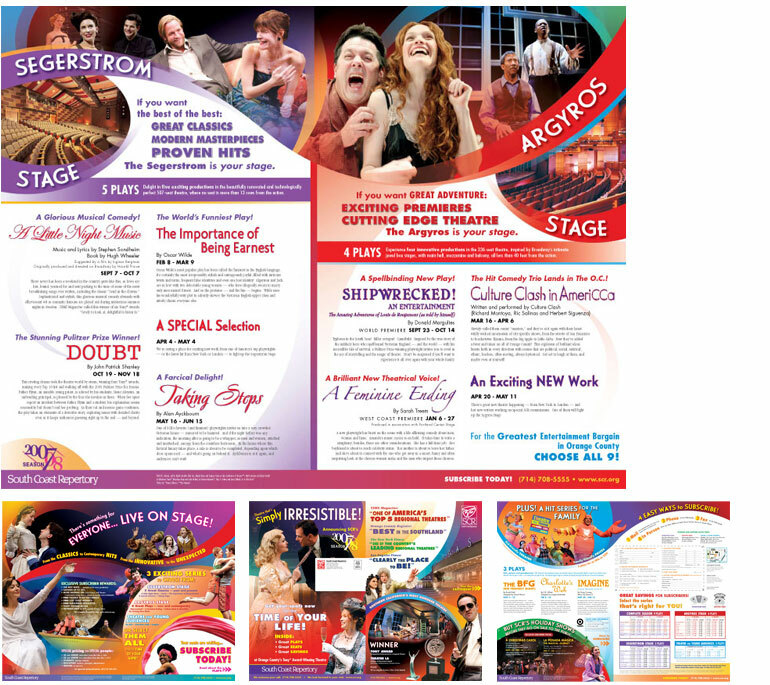 From left: Front of direct mailer (subscriber prospect card); Front of "First Nights" brochure; Front of the Theatre Conservatory's Professional Intensive Program brochure; Front of the Theatre Conservatory's Adult Program Winter Session brochure. Design for South Coast Repertory's advertising campaign in the Orange County Register's "Squeeze OC" magazine. From left: Ad for upcoming play, "The Caucasian Chalk Circle;" Ad for the 2005-06 season; Ad for the 2005-06 season; Ad for upcoming play, "The Caucasian Chalk Circle." 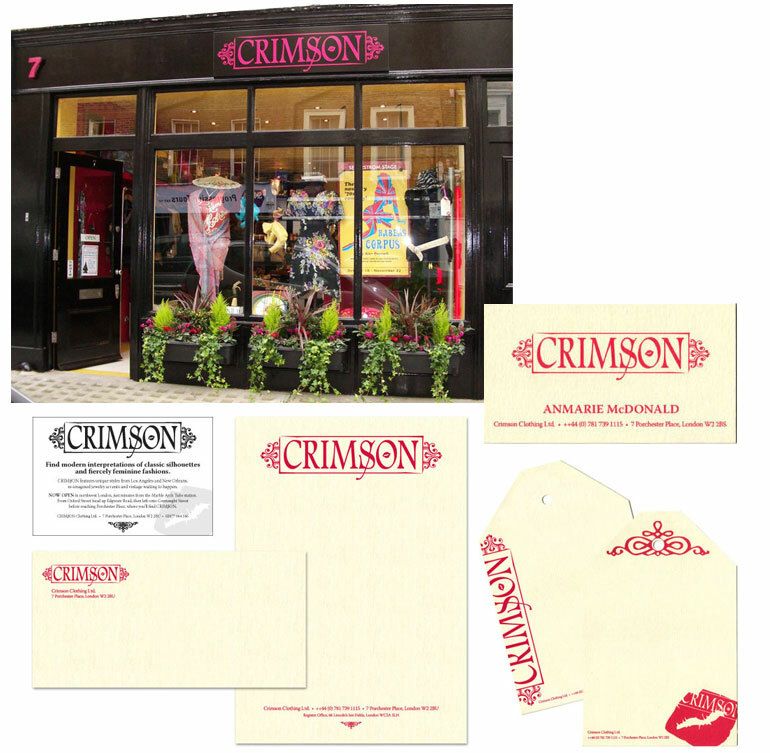 Design for CRIMSON clothing store's logo and identity system (London). Clockwise from top left: Photo of storefront with custom logo signage; Business Card design; Two designs for clothing hang tags; Letterhead and envelope design; Black and white newspaper ad. 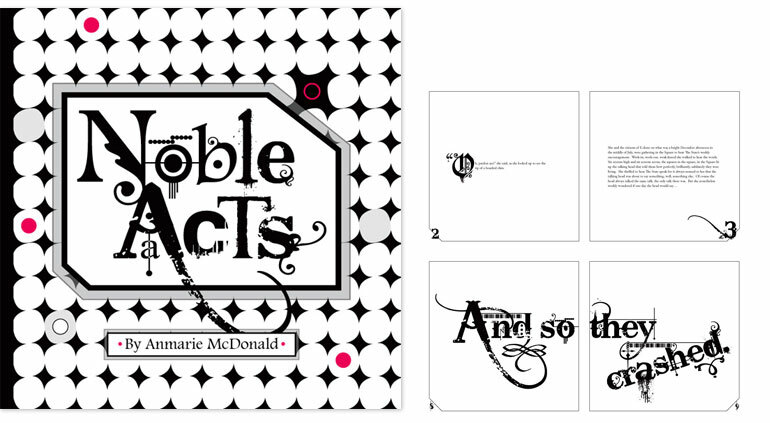 Book design for "Noble Acts" by Anmarie McDonald. From left: Front cover design; Two sample interior page spreads. 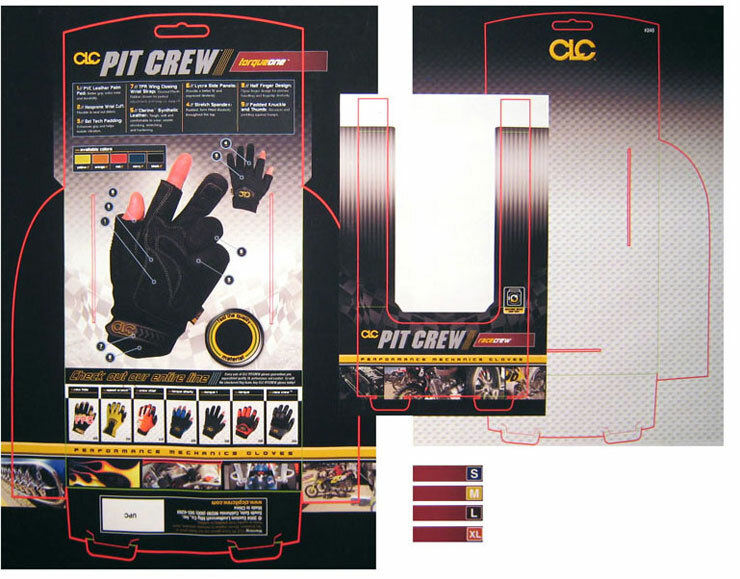 Production art for Custom LeatherCraft's Pit Crew mechanic's gloves package. Clockwise from left: Design for back of package; Design for inside front insert (placed in front of gloves); Design for inside back insert (placed behind gloves); Design for wrap-around size tabs. 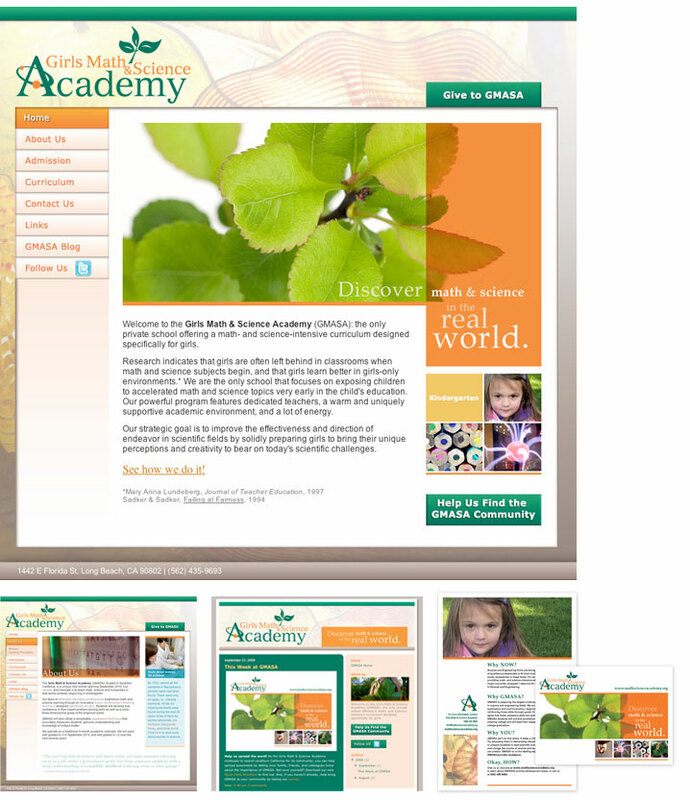 Identity and Website design for the Girls Math and Science Academy. Clockwise from top: GMASA website home page; Direct mail marketing brochure; GMASA Blog design; GMASA website sample interior page. 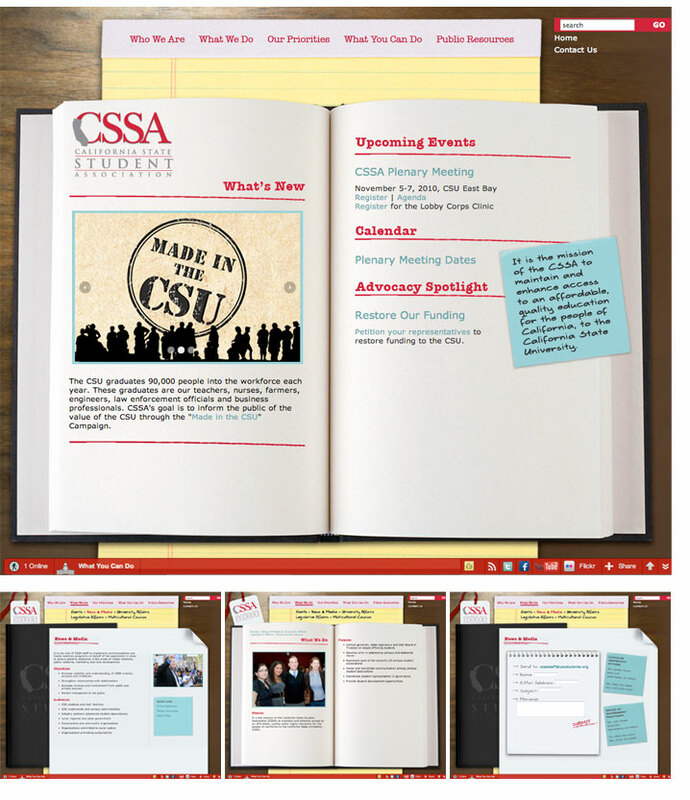 Front-end design for the California State Student Association website. Clockwise from top: CSSA website home page design; Contact page; Sample interior page design (level 1); Sample interior page design (level 2). Font-end design for the California State University's Hospitality Management website. 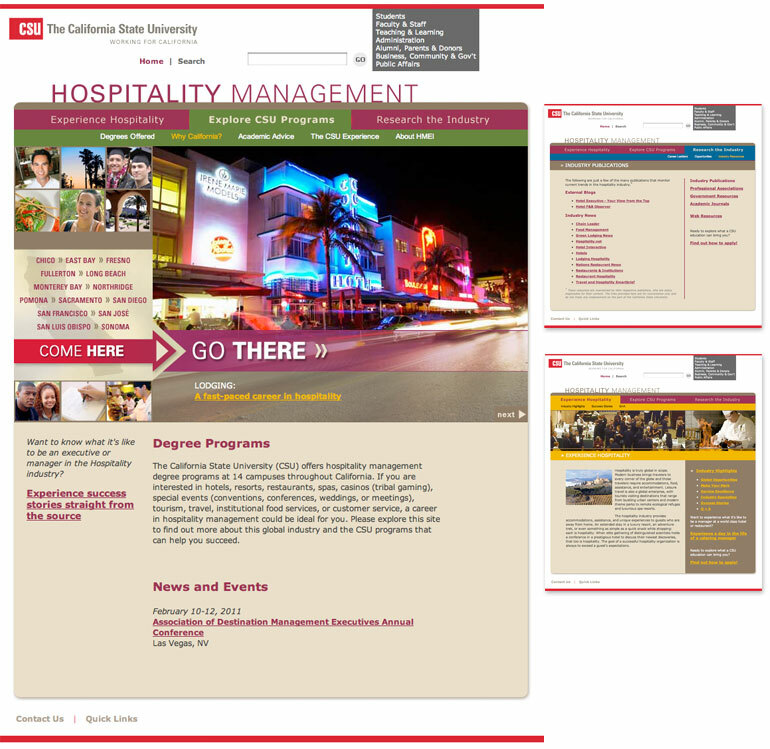 Clockwise from left:CSU Hospitality website home page design; Sample interior page design (level 2); Sample interior page design (level 1). 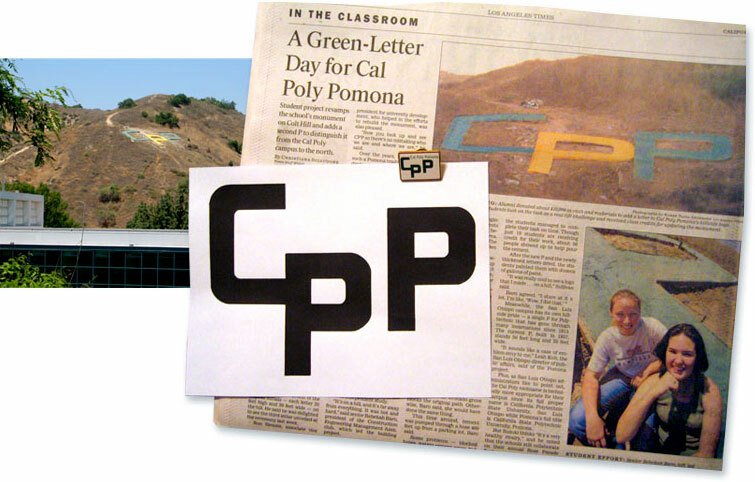 "CPP" Logo design, constructed on the hill behind the Cal Poly Pomona campus. Clockwise from left: Photo of the concrete letters on the campus hillside; Newspaper article about the logo design contest and construction; The contest-winning logo; Custom pin given out at ribbon-cutting ceremony. Studies in black and white typography. 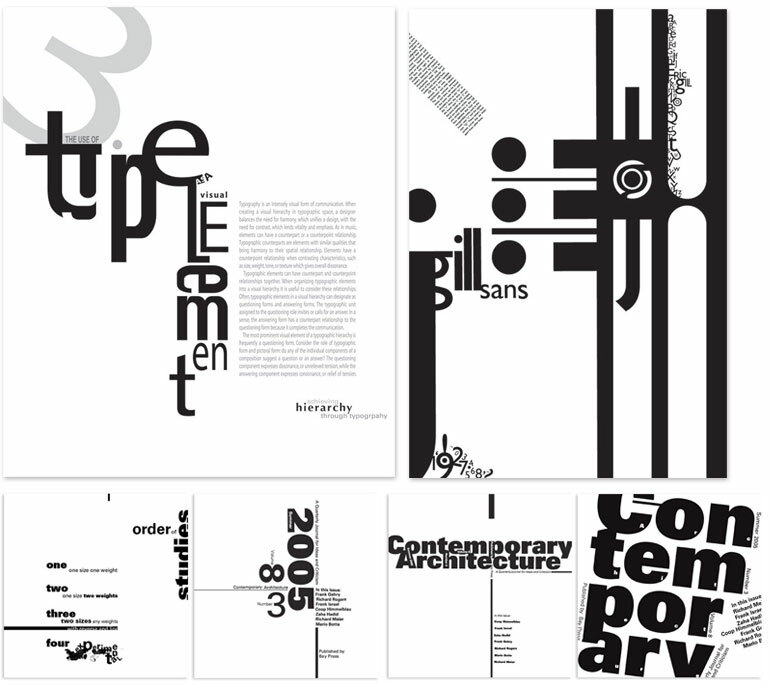 Clockwise from top left: "Type as a Visual Element" chapter heading for book; Poster celebrating the unique characteristics of the font Gill Sans; Four sample pages from the book "A Study of Hierarchy" in which each page displays the same content with different emphasis. Manifesto project entitled "Before It's Too Late" about adopting pets from animal shelters. Consisted of book and poster design. 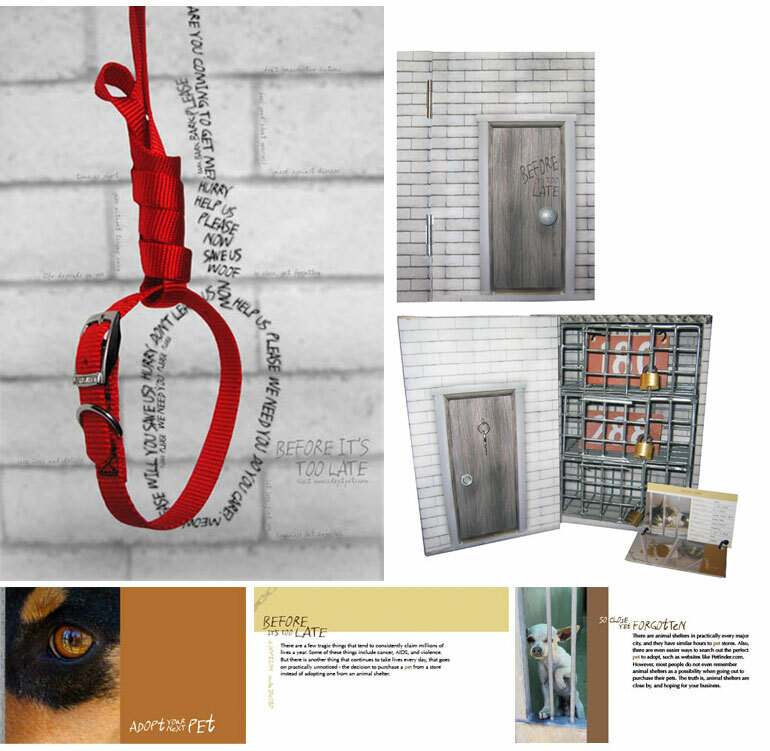 Clockwise from top left:Poster design; Front of book (made out of printed paper, wood, bolts, cages, and other materials, with hinged front cover); Inside of book (real key hangs on the back of the door, and unlocks three cages containing the book's three chapters; Three sample pages from the book. Animation project for a fictional MTV commercial. Designed in Adobe Illustrator, animated in Flash.